Most Popular OS Environments Including Linux 32/64, Windows 32/64 7/8/8.1/10 and Solaris. RTOS support for VxWorks, Integrity, Lynx OS, RTX Windows/Shared Mode. Windows Managed .NET DLLs Provides Quick Integration with Visual Basic, .Net, C++. The Best National Instruments LabVIEW & LabWindows Support in the Industry. 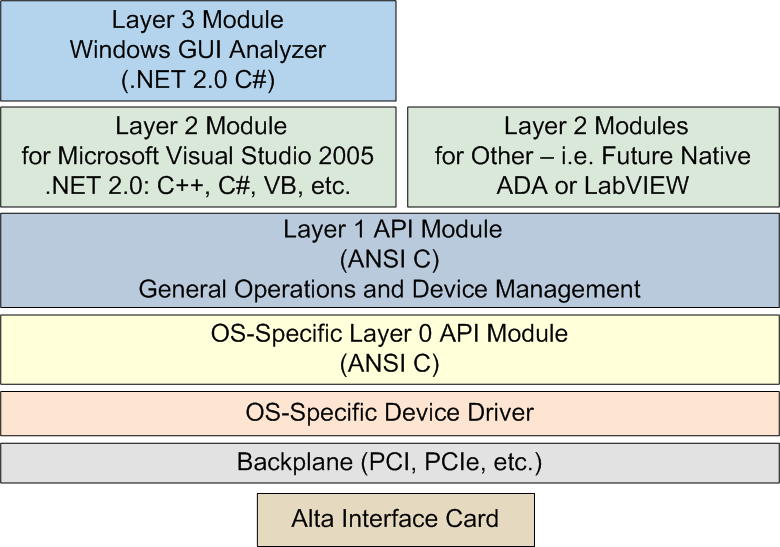 Full 8.2+ .NET support or LabVIEW 8.6+ VI Library (AltaAPI-LV); Includes LabVIEW-RT (Real-Time Support). AltaAPI is designed to meet various application requirements – and to provide fast integration (with over 80 sample programs). When first starting development, the design engineer may want a Linux or Windows application for test verification. Then the application may need to move to an RTOS, such as VxWorks, for deployment. Or maybe the test group needs to develop a LabVIEW or .NET GUI for ATP or a custom application – even a network based application. The AltaAPI can migrate as your program requirements change. Register to download the User’s Manual for a full review of this powerful tool set. Contact the factory for our latest operating system version and RTOS support. 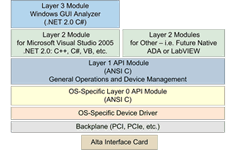 Key ANSI C Layer 1 with source code provides easy integration and porting – over 80+ example programs to jump start your application (regardless of OS). Same API Used for Multiple Protocols (1553 and ARINC). Here you can find documentation pertaining to the AltaAPI. For additional documentation and software, please visit our secure download area.